These rain drops admittedly have a limited use. I mostly use them in Nursery or Sunbeams, as they don't hold the interest of the older children. I like to pass one out to each child (you really have to have one for each child!) and sing "Rain is Falling All Around." You just hold the end of the yarn and dance the drops around like they're raining. These youngest kiddos are still trying to learn about where their bodies are in space. So, slowing down the last line of the song, "Rain is falling on my nose, on my head and hands and toes," and having the rain drop touch each body part when mentioned is a fun challenge for them. 1. Cut out a rain drop-shaped template out of the card stock or cardboard. Size really is just your personal preference. Mine are about 2 1/2" tall. 2. For each rain drop, trace and cut out 2 pieces of felt, using the template as a guide. 3. 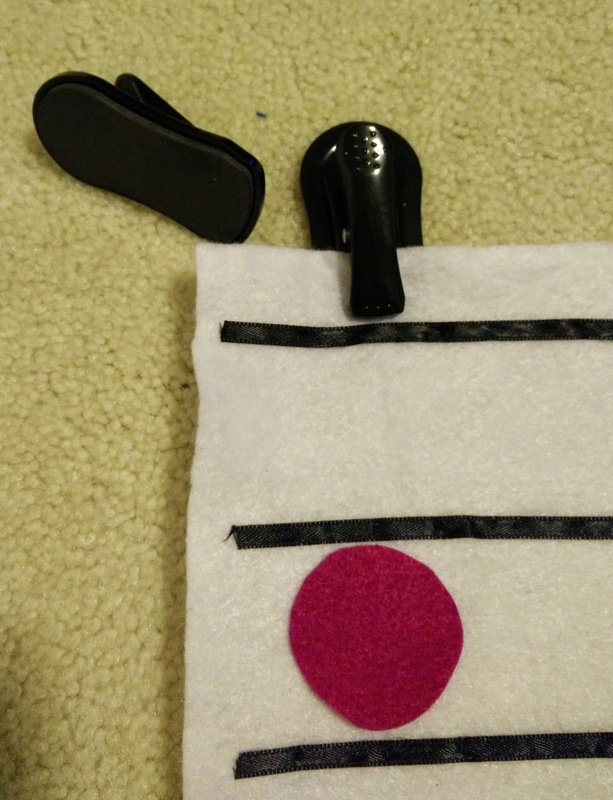 Sew the 2 pieces of felt together, sewing only around the edges to make a kind of tiny bag. Leave the area by the point open, as you will need to put rice in through this hole. 4. Put rice in through the hole. ;) I don't know how much. 2 teaspoons, maybe? The idea is just to add enough weight so the rain drop will hang down nicely. 5. For each rain drop, cut 1 piece of yarn to your desired length. Mine are about 12" long. 6. Insert one end of a piece of yarn (maybe 1") in the hole of your tiny, rice-filled bag. 7. Sew a lateral line across the top of your rain drop to keep the yarn in place. Sew around the tip of the drop to keep the shape of the drop intact. 8. Glue on the googly eyes wherever you'd like them. 9. Apply fray check to the exposed end of the yarn, so it will last more than one singing time. And now you're ready to sing, sing, sing! The consumable materials required for this project are super cheap, so it didn't bug me that it took a little while to make. You could even grab the Primary music leader from the ward next door and help each other get these whipped out in no time. Who thinks it's about time for an easy DIY musical instrument? I'm always up for that. 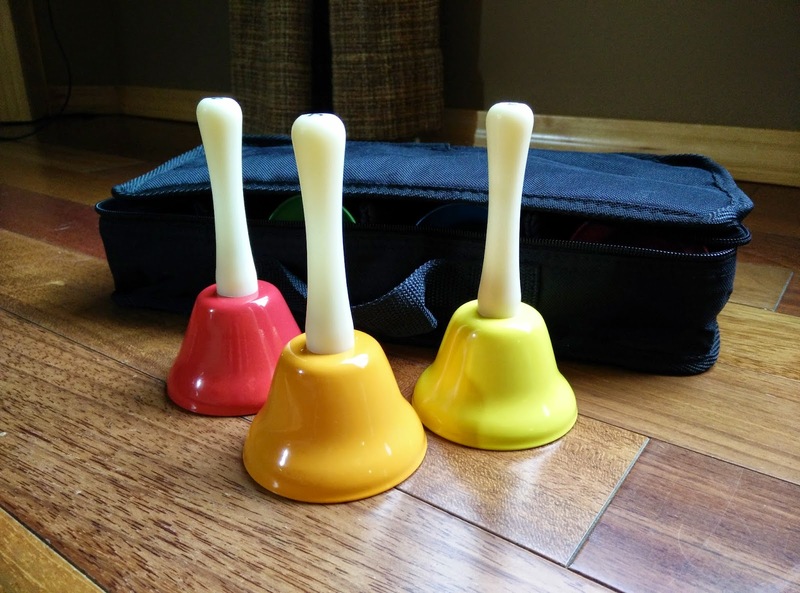 :) I made these bell shakers one year for family Christmas caroling, but they're so inexpensive and easy that you can make them for your whole Primary. Plus, they're versatile enough that you can use them year round! I found these at my local craft store. You have to buy them in large packs, of course. I made enough for every Primary child to be able to use one, plus a couple extras for teachers or visitors. Ten bucks made me 50 shakers. Bend the pipe cleaner into a circle. Slide the bells close to the connected ends (so the kids won’t be holding onto the pokey parts). 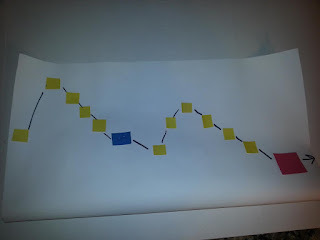 If you have kiddos who simply must disassemble things, then you could preempt by putting a few drops of hot glue at the connecting point. I found that setting behavior expectations before passing out the bells was sufficient for my Primary. And that's it! You can use these just like you would egg shakers, but the kids will enjoy the variety. Looking for more? If you had so much fun that you want to make more instruments, check out my tutorial for sand blocks here. Melody maps are a wonderful tool for both junior and senior primary. They help the children visualize the song. Adults read music to learn a song. A melody map is essentially the same idea. Young children incorporate the same skills reading melody maps as if they were reading sheet music. It’s a wonderful preparation for eventual sight singing. The amazing thing about using melody maps is that they can be used in a variety of ways, thus allowing flexibility and versatility when teaching different age groups. Initially I was nervous to teach the junior primary with melody maps. I decided to give it a try. I taught the first part of the song without the melody map, and then taught the second part of the song with the melody map. I noticed that in weeks following as we reviewed the song, the children were more confident in singing the portion of the song that was learned by using the melody map. They had memorized it quickly. Senior primary will catch on to melody maps relatively quickly. 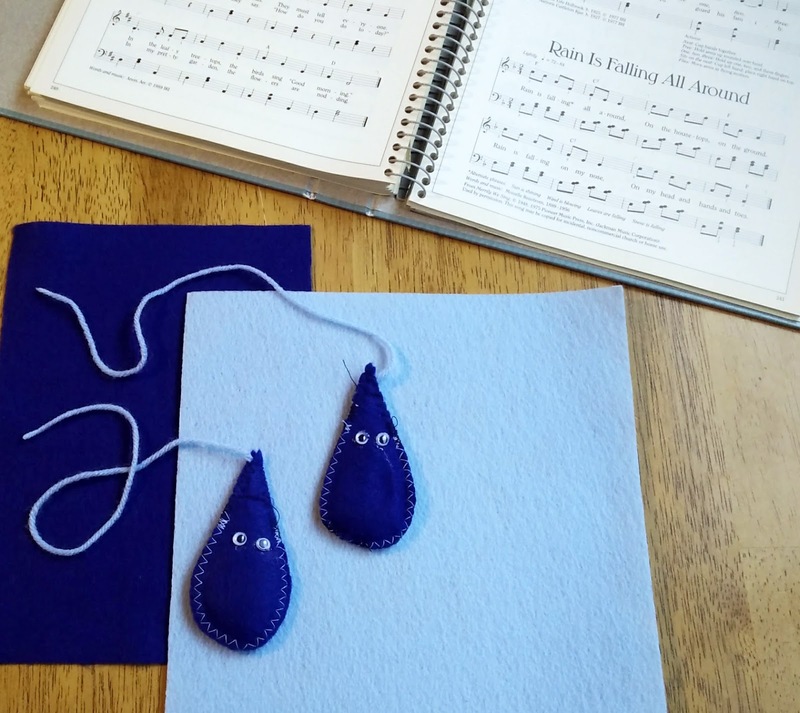 To keep them engaged, you may want to mix up the pages and have them place them in the correct order as you sing the song. You can also cut out symbols and images which the children can place on the map when they sing certain words. -Picture cut-outs or symbols that you desire to use that correspond with words often sung in the song. 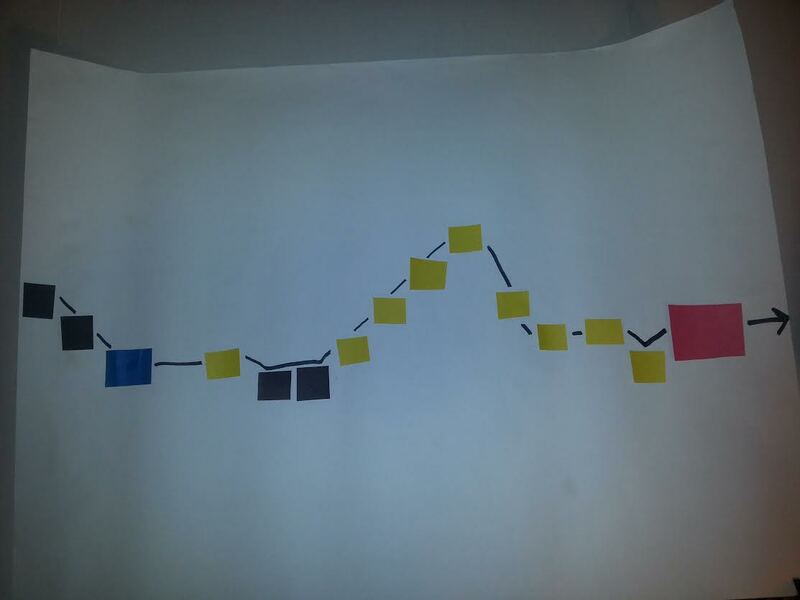 Construct a melody map as shown in the pictures below. I happened to have several small squares of construction paper already cut out, so I used those. You can simply draw the symbols using different colored markers. You can also use different symbols such as triangles, circles, etc. Make sure to have the sheet music in front of you as you are constructing the map so that you can accurately represent where the notes are placed. Spacing is very important. 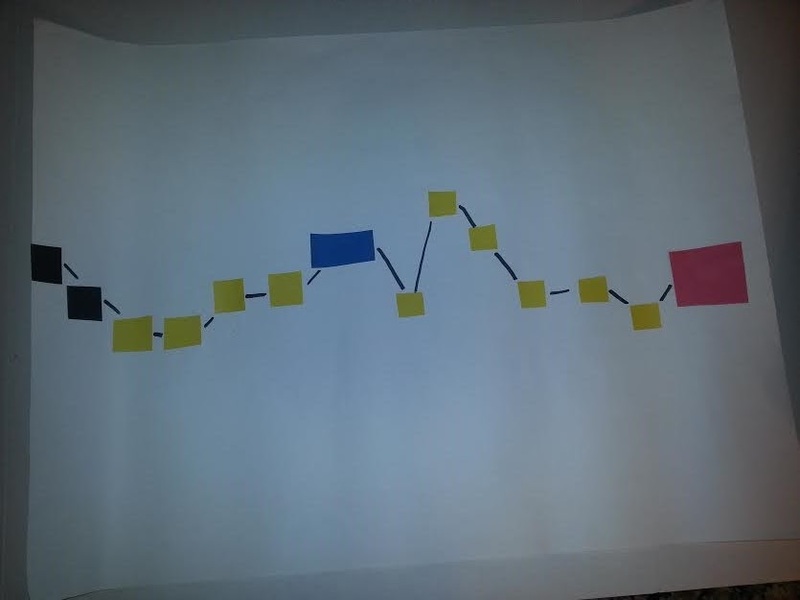 There are four phrases in the song, so I constructed a map to represent each of the four phrases. "The Lord gave me a temple to live within on earth." "Once in Heaven I was spirit, but I left my home at birth." "I'll make my temple brighter. I'll keep my spirit free." "My body is the temple my Father gave to me." Place the maps on the white board in random order. Ask the children to look for the map that best represents what you are singing and raise their hand when they know the answer. Sing the first phrase of the song a few times until most of the hands go up. Ask a child to come to the front of the room to choose the correct melody map. Have them hold it in front of the classroom. Ask the children to sing that phrase with you a few times while pointing to the symbols as you sing. Repeat this process until all phrases of the song have been sung. Bring out the melody maps again and place them in the correct order on the board. Hand out various small pictures that you cut out previously to some of the children. As you sing the song, ask the children to come up one by one and place their picture on the map that corresponds with the word sung. Looking for more? 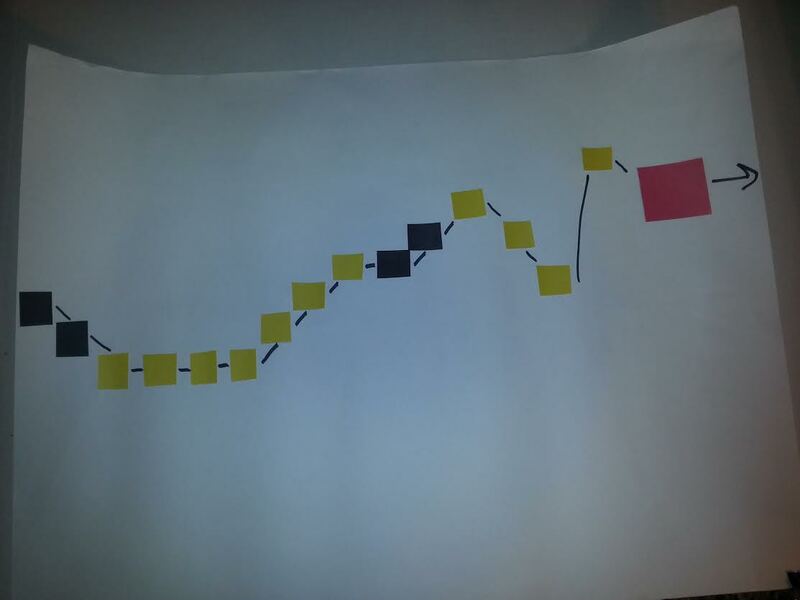 For an example Singing Time that incorporates a melody map, see my post here. Sand blocks: you can have some, too! 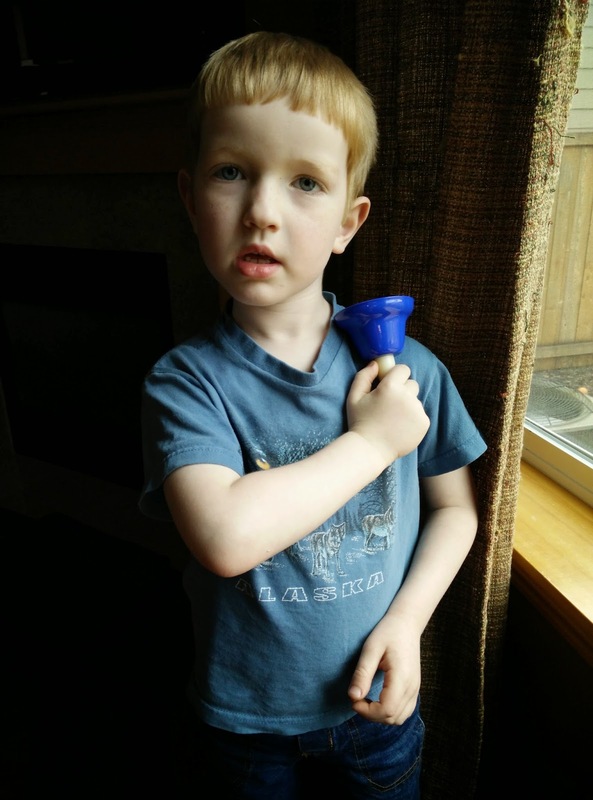 It is a truth universally accepted that kids love to make noise. Sand blocks are a dream come true for most youngsters, as they can scritch, clap, tap, you name it! 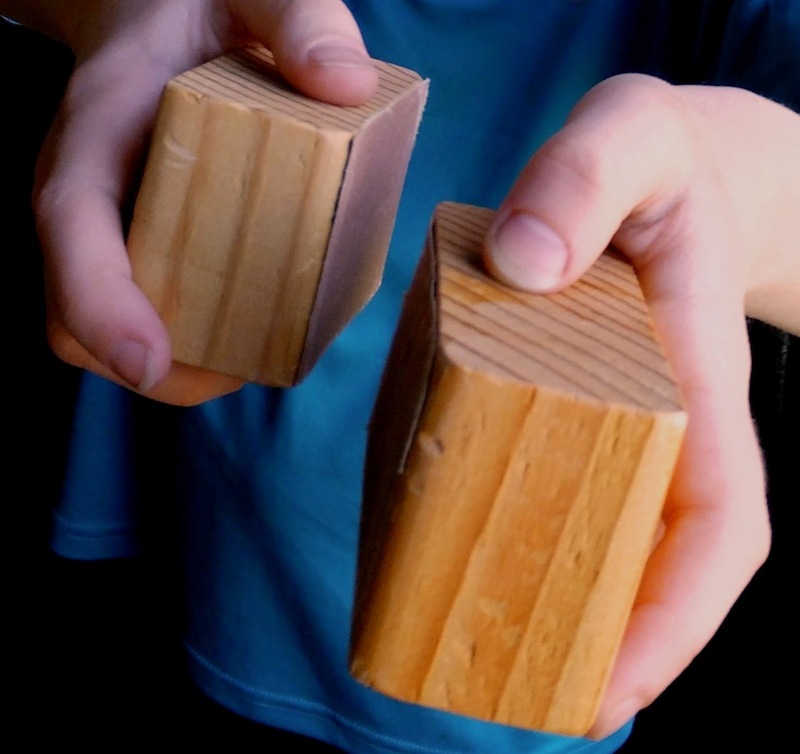 When I was a new Primary music leader, sand blocks were the first instrument I acquired, since I was able to make them inexpensively and easily. Note: I do not consider myself crafty by any stretch of the imagination. When a friend suggested I make these, I protested at first. However, I'm glad my husband encouraged me to give it a try. Although time consuming to make in the amounts I needed, this project is really quite simple. Yes, you can just go buy sand blocks and save yourself the time. BUT...The cheapest I've seen sand blocks for sale from learning supply stores is about $4 per set. I spent $20 on supplies and made 48 sets. (That's $.42 per set, if you don't have a calculator handy.) If I'd bought that many sets, it would have cost me $192. Not happenin'. Granted, it took me (and my husband, the chief saw-operator) numerous hours to make that many sand blocks ourselves, but if you have more time than money, DIY is definitely the way to go. Can you imagine if I'd paid retail prices for all these? 3. Using a paint brush, apply the stain to 5 sides of each block, setting the remaining unpainted side on newspaper to dry. When dry, stain the last side and dry completely. 5. 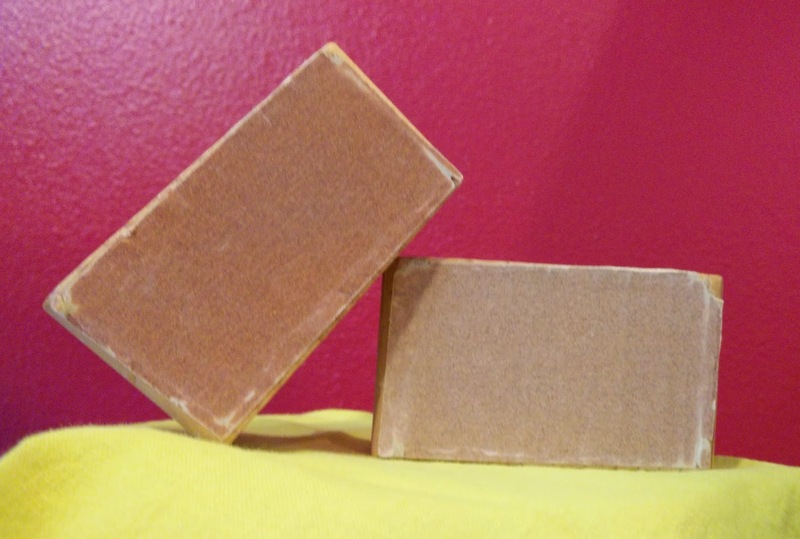 Using wood glue, glue one piece of sandpaper onto each dried block. Place sandpaper-side down to dry, so the weight of the block works in your favor. Dry overnight, and then you're good to go! Last Sunday, I experienced Primary music bliss. I walked into the room carrying some black cloth cases, and the children's eyes got wide. They grinned, whispering excitedly to their neighbors as they pointed at what I was carrying. Yes!--I confirmed with a grin and a nod. It was hand bells day. I don't blame them at all! I feel the same way. The bells are colorful, the tones are clear, and the feeling of everyone working together to make beautiful music is just impossible to beat. The bells that I use are a basic 8-bell diatonic set for the key of C, from middle C to the C one octave above, (meaning no sharps or flats). Mine are Schylling brand, from amazon.com, here, but there are different brands on sale all over. Each color is a different note. There are also add-on packs with accidentals, higher notes, and lower notes. I mostly just have multiples of this basic set, in order to get more children playing at the same time. My senior Primary has 50+ children there every Sunday, so mass involvement is crucial to me! I also got carrying cases, since the initial packaging isn't really made for long-term use. I searched long and hard on Pinterest to get ideas for charts to go with the bells, and I settled on one from a blog called Imagine Our Life. I don't know anything else about the blog, but this felt pattern and I fell in love at first sight! 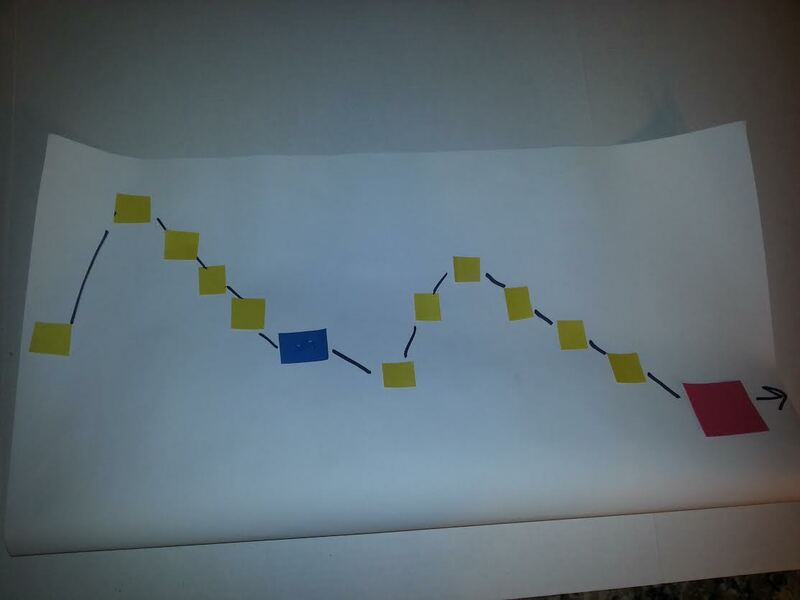 I opted to go with this chart because it's movable. 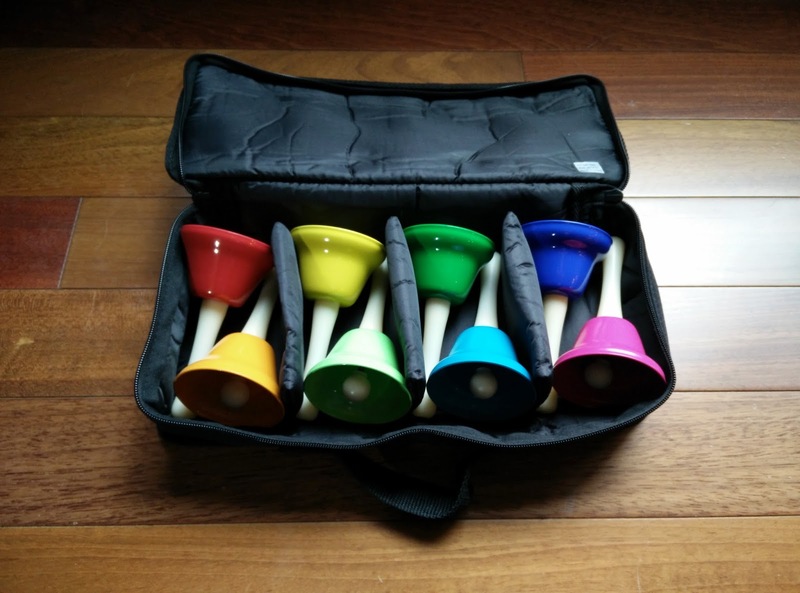 I don't have to make a new chart for each new song I teach with bells; I can just move the colored notes--which adorably match the colors of the bells--as needed, since felt adheres to itself pretty well. I also love that it utilizes a music staff. 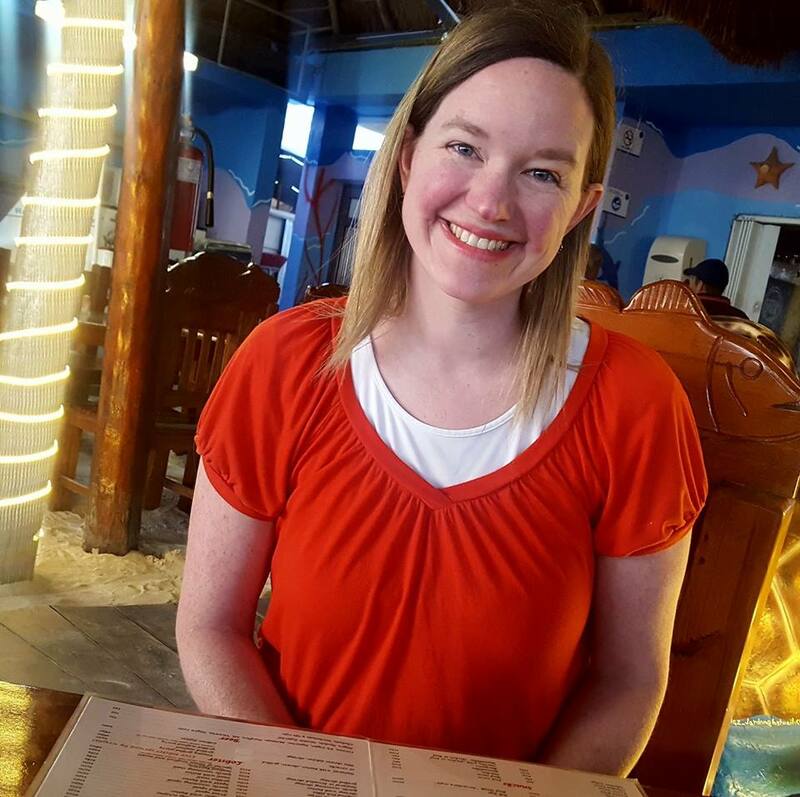 I don't teach the musical notation at all, but the children who can read music find it helpful, and I feel that I'm helping to establish a foundation for all the rest. I found all the needed supplies at my local craft store. I got a yard of white felt for the base, and the small colored felt squares were something like $.35 each. Nice. 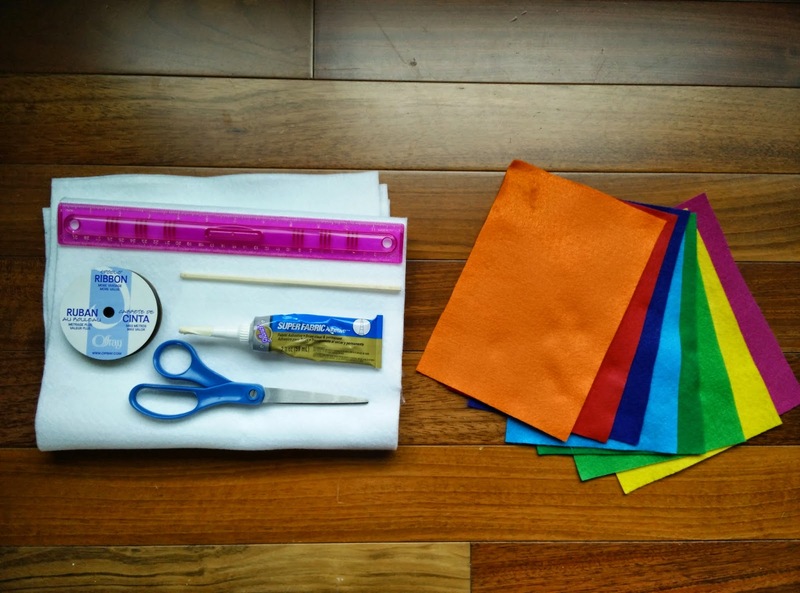 Supplies for making a movable bells chart. Here's a close-up of the ribbon, felt circles, and magnet clips that I use to hold up the chart on the chalkboard. Well, the circles are basically circular. I used a toilet paper roll as my stencil. If you're interested, hop over to the other blog for the tutorial. In my picture of the chart above, you can see that I use the notes from the guitar chords listed in The Children's Songbook. The song shown is "Did Jesus Really Live Again?" I use a drop down menu on the Church's interactive music player to change the key of the song to C to match my bells, and the listed chords are transposed, as well. What a dream come true! While in Primary, the children play the chords like an accompaniment, and we sing the melody over the top. I make sure to print out a copy of the transposed song for my pianist, so she can play the melody line with us. 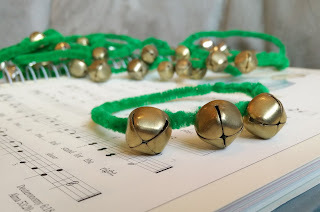 Next time I bring in the bells, I plan on having the children play the melody line, to change things up. On my very favorite Primary music site, To Teach a Child a Song, there is an example of how to mix in harmony notes, too. Resting position is no joke. Before I pass out the bells, I have the children practice the motion with me: hand on shoulder, straighten arm to play, hand returns to shoulder. We practice again in unison, pretending to ring our bells at the exact moment I reach up and touch a chord on the chart. Then we pass out the bells. I have roughly half as many bells as children, so I have them trade off with a neighbor after each time singing through the song. If you're new to using complex activities in your singing time, be aware that you might be singing the song completely by yourself. Even children who know the song well may be so focused on their playing that they forget to sing. That's okay! They are hearing the song over and over again, in a new and interesting way.